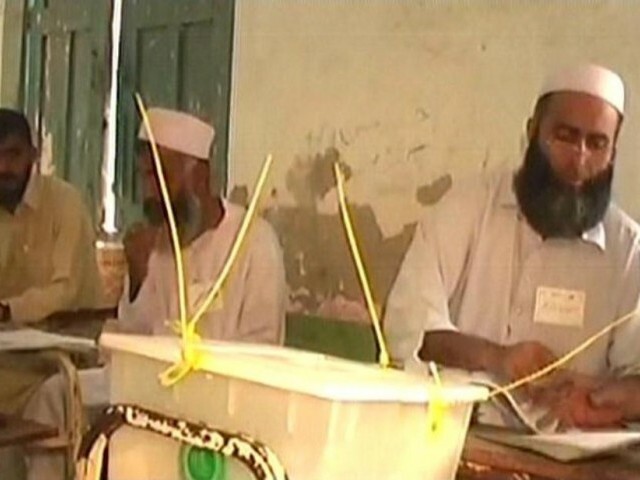 Express News screengrab of a polling station in DI Khan. DERA ISMAIL KHAN: According to unconfirmed results, Pakistan Tehreek-e-Insaf’s (PTI) candidate is in the lead in the by-elections for PK-68 Dera Ismail Khan, Express News reported. 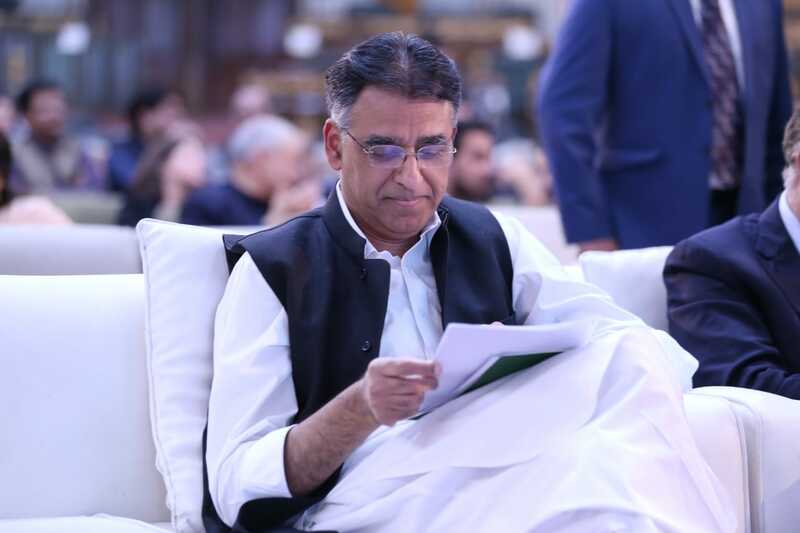 PTI’s Ehtesham Javed Akbar reportedly secured 37,178 votes, while his opponent, Makhdom Mureed Kazim Shah, an independent candidate, secured 32,640 votes. In general elections 2013, PTI candidate Humayun Khan had secure just 1,613 votes. The voting started at 8am and continued till 5pm. With a total of 127,617 voters registered in the constituency, 108 polling stations were set up. Thirty-one of these stations were declared “highly sensitive” while 29 have been declared “sensitive”. The winner, in all likelihood, will either be a landlord or a candidate with the backing of the constituency’s influential families. There are 13 candidates vying for the Paharpur seat, but the by-election is likely to be a two-horse race between Shah and PTI’s Akbar. 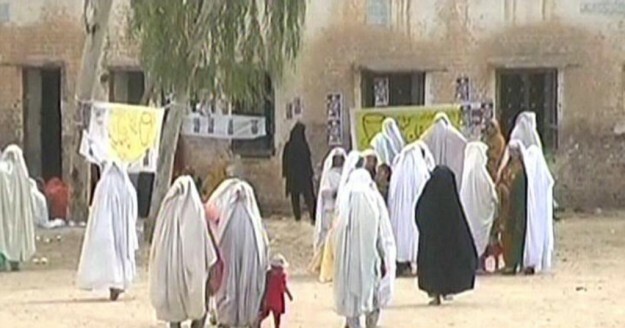 Express News screengrab of female voters in DI Khan. Strict security arrangements have been made to avoid any untoward incident and there is an official holiday throughout the district. PK-68 fell vacant on December 12, 2013 when election tribunal judge Yahya Zahid Gilani disqualified independent candidate Javed Akbar Khan for submitting a fake degree and ordered a re-election. 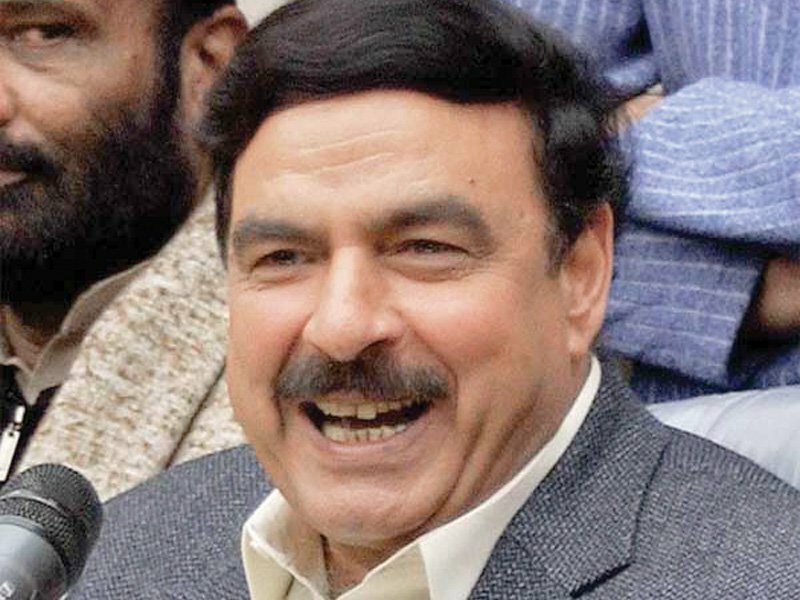 Akbar had won the seat in the general elections of 2013 by obtaining 41,349 votes. In the 2013 elections, voter turnout was 66.44% and Javed won by a margin of over 10,000 votes. Expected to be a two-horse race between PTI’s Ehtesham Javed Akbar and independent candidate Mureed Kazim Shah. A total of 127,617 voters are registered in the constituency and all arrangements for re-polling have been finalised. 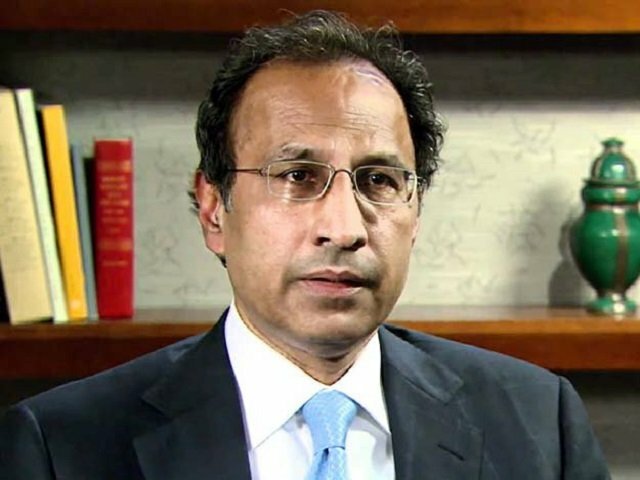 PTI said on Saturday that his party would not participate in any by-elections in the province. Sir, PTI lost NA1 in By-election (Peshawar) to ANP while PTI was in government. So much so that ANP workers beat PTI workers on poling station yet party leadership demanded restraint and non use of government influence. Similarly PTI lost PK 45 to PMLN in Bye elections. This has never happened in my knowledge in the history of Pakistan that the party in government loose the election becasue every government uses their influence but PTI is not like that. PTI lost NA-1 in by-elections and they didn’t pointed out rigging for their defeat rather in-fighting. I take it that the PTI candidate is son of the previously disqualified candidate Javed Akbar. So much for change and revolution if PTI party tickets are hereditary. Really? If you have any questions about the results, why don’t you take your complaint to the election tribunal? That is the forum for such complaints according to the “constitution” so vehemently articulated by the “democrats”, not blathering about it in ET blogs! PTI didn’t claim rigging in KP. If you or your like minded PMLN, ANP etc have any objection, then why don’t you let Imran Khan dissolve the provincial assembly?? Why have your like minded brought resolution against assembly dissolution? where are tribunals, look at the results of NA 128, what has happenned. dear rigging everywhere not this time since 1970. Leader are complacent as mukmuka is done. first time in the history, some one has challanged the rigging so balantly. free and frare elections are the need of hour. well done IK. @Zubair: Dear Brother on this side of the border the ruling Shromani Akali Dal got only four seats out of 13 in the general elections reason the Election commission is power full and for a successful conduct of free and fare elections you need an Election commission with vast powers. The politicians are afraid of EC and dare not do dhandli yes some stray incedants are not rules out. Each voter have an I Card issued by the EC and the photo of the voter is also there on the voter list and one day you will have to do all this to avoid rigging etc. This shows the performance of PTI in KPK. PTI has not resigned from KPK govt then why should it boycott the provincial elections.? Zabardast, come on PTI. Keep punching them left and right . What I find fascinating is that the Tribune did not mention that ANP,JUI-F,PPP,PMLN all joined forces to defeat the PTI candidate…Tribune this is why you have no credibility. Now other parties will claim that rigging took place to win seat for PTI . What a great revolution. The fake degree holder disqualified and his son became PTI candidate and the family got the seat back. So much for the new politics. The fact is this family proved they can win independently and they can win on any other party ticket. Imran Khan has offered if Molana Sahab has a doubt in this Election. IK is ready to have the elections once again!!! This is the confidence which no party has!!! Geo Imran Khan!!! So JUIF and ANP….and PMLN and PPP, both pairs which are in theory composed of polar opposites…..unite against one candidate and still lose? Ha,ha! This truly is a stinging burnol. Thank you God. The fake degree holder who was independent joined PTI and the seat remained in the family. There is a golden opportunity for Mullah from Baluchistan to join PTI and have his son or brother contest the election and reclaim that seat. @Zubair: I am living in PK 45 and know what not done by PTI? IK had 5 jalsas in such remote areas and spent million of public money to buy the people even than PTI lost the seat. Man, these seats are dedicated to the people who leave and again give them to their family members. Why not “jaile degree” holder PTI MPA given ticket to any other PTI worker? why his own son? what is the quality of his son which other PTI worker in same area doesn’t have? be rationale, you naunahal have been taught to abuse others your leadership is teaching you “jo ikhtilaf kare os ko galiyan deni sharoon kardo” this is the new Pakistan IK given to his few hundreds supporter? that’s why PTI is squeezing to ZERO…. and I guarantee you if general election held soon PTI will not win eve a single seat in KPK. this is my challenge! PTI candidate who has won the seat in the bi elections also stood in 2013 general elections and he stood against his father as a PTI candidate in that election and his father was an independent candidate not a PTI candidate in 2013 elections. If you belong to that area, I too belong to PK68. in PK 45, PMLN local candidate secured 28,252 votes to win the PK-45 seat against the 23,597 votes of “outsider” candidate of PTI. That candidte did’t belong to the constituency yet he increased the PTI vote bank. PTI was facing in-fighting becasu od the outsider candidate yet such internal division, brought PTI close to PMLN candidate.